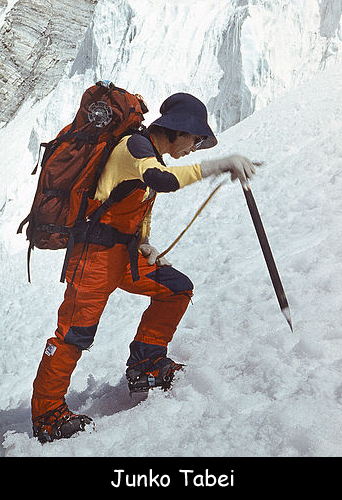 Junko Tabei was one of the most famous female mountaineers. She is best known as the first woman to reach the summit of Mount Everest. She achieved this milestone on May 16, 1975. Despite this, she was the thirty sixth person to climb the Everest. She is also the first woman to summit the highest mountain on each of the seven continents. These seven mountains are collectively known as the Seven Summits. Junko Tabei was born on September 22, 1939 in a small agricultural town in the Fukushima prefecture in Japan. As a child, Junko had a petite body frame and was considered weak and very fragile. A classroom mountain-climbing expedition to Mount Nasu ignited her interest in mountaineering. She attended Showa Women’s University and earned a degree in English and American literature. After this, she joined several mountain-climbing clubs and then formed the Ladies Climbing Club in 1969. In 1969, Junko Tabei founded the Joshi-Tohan mountaineering club for women only. She went on to become an environmental advocate and completed graduate studies at Kyushu University. In 2016, she also led a group of young people affected by the Tsunami Fukushima disaster on an expedition to Mount Fuji. She died on 20 October 2016 because of cancer which she was diagnosed with in 2012. Declan, Tobin. " Junko Tabei Facts for Kids ." Easy Science for Kids, Apr 2019. Web. 26 Apr 2019. < https://easyscienceforkids.com/junko-tabei/ >.